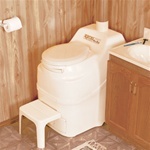 The composting toilets shown on this page are all self-contained composting toilets. This means that the composting process takes place in a drum contained within the unit itself. 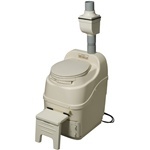 There is no central composting unit to install on a lower level, such as in composting toilets central systems. 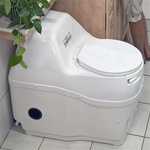 Not sure if composting toilets are a good option for you? In a nutshell, a self-contained unit like the ones shown here will be easy to install, won't use any water, and like all our other units, will not smell. Odorless operation is ensured by a venting system that maintains a partial vacuum within the unit. 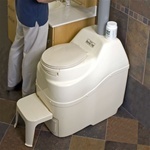 Visit our Composting Toilets Frequently Asked Questions page for more information. For more information on the products you see here, please visit our Customer Testimonials category. We know that customers who have purchased and used our products can always provide the most expert information, and that's why we prominently feature customer reviews and testimonials all over our website. Within the testimonials category, you'll find reviews further broken down by Self-Contained Unit reviews and Central System reviews. We've even got a category of testimonials written by customers who've used our products in commercial applications! Find out what other people like you are saying about these great systems. 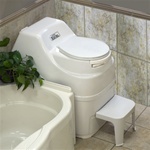 Not sure which toilet system is right for you? Visit our Product Selection Guide (you'll find a link at the top of this page), where you'll find the main specifications you need to make your initial decision and comparison. Once you've found a unit that looks like it might be a good fit for you, click on the photo and you'll be taken to the product detail page. From there you can review detailed specifications about capacity ratings, installation considerations, water or electrical requirements, and more. Please also be sure to download and review the product instruction manual for the toilet before making your purchase. We want to be sure you know everything there is to know about your new waste treatment system before it arrives. Before purchasing, please take the time to carefully review our Return Policy. We want to be sure our customers understand that there is a 20% restocking fee on all returns, and you are responsible for the return freight costs. For complete details, please see the Return Policy, and if you have any questions or need clarification, please don't hesitate to contact us. We are available Monday through Friday by calling 800-690-0132 or via email. If we aren't available, please leave us a message and we'll get back to you as soon as possible. We're here to help, and we look forward to talking to you! For more unique and eco-friendly products for your home, you might also be interested in visiting our sister store, Home Products 'N' More. You'll find a variety of items for your home, garden, and auto, and free shipping and handling is available on everything. Some of our eco-friendly products include recycled plastic outdoor furniture and solar outdoor lighting. We also offer sandbox kits, landscape edging kits, and raised bed gardening kits that are all constructed of composite landscape timbers that contain recycled plastic products. Other eco-friendly products include our line of compost tumblers and compost bins. Home composters are a great way to reduce the amount of waste you send to the landfill and recycle back to nature at home.